Some Player's have been Receiving Error on Android Clash of Clans is a “Your device is not compatible with this version” error after attempting to update their Clash of Clans app to the newest version. 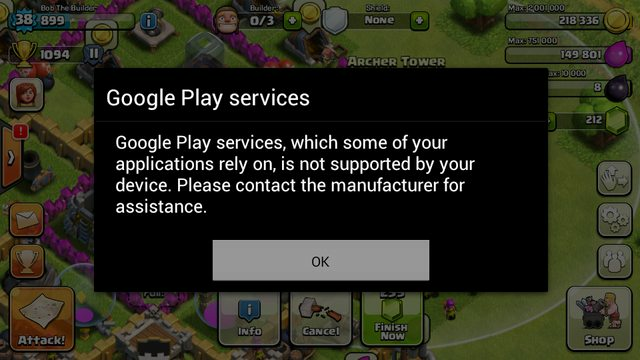 If you’ve been running into issues downloading or updating Clash of Clans via the Google Play Store for Android, there’s a way to fix the errors and install the update.The error seems to affect all sorts of Android phones, both new and old with no particular preference toward OS version or smartphone manufacturer. How to fix the Error “Your device is not compatible with this version” some tips from His team's, Supercell recommends navigating to your Settings app, and then opening the App Manager before selecting the Google Play Store option. From here, you’ll want to select either the clear data option or the clear cache option. This should reset whatever corrupt data is hiding out in your Android Google Play Store’s cache, and allow you to update your Clash of Clans to the newest version. If any reasone this fails, try signing in and out of the Google Play Store before doing a soft reboot of your phone. Another alternative is uninstalling and reinstalling the app, or trying to install Clash of Clans via the .apk file. If you’re still out of luck, the best option would be to hold on tight and complain loudly on Twitter.